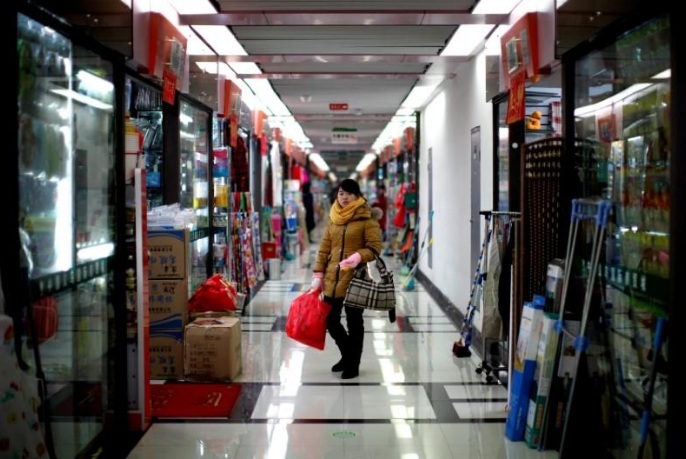 FILE PHOTO: A woman pauses as she shops at a wholesale market in Yiwu, Zhejiang province January 11, 2011. BEIJING - The Asian Development Bank raised its outlook for China’s economic growth this year on the back of strong domestic consumption, an export recovery and solid growth in services. ADB now expects China’s economy to grow 6.7 percent in 2017, up from a previous projection of 6.5 percent made in April. The 2018 growth forecast was also raised to 6.4 percent from 6.2 percent. China’s economy has grown at a faster than expected 6.9 percent pace in the first half of this year, on track to beat the government’s target of around 6.5 percent despite Beijing’s efforts to curtail risky forms of investments and rising debt. “The PRC economy remains resilient, solidifying its role as an engine of global growth,” said Yasuyuki Sawada, ADB Chief Economist. ADB’s forecasts for China in 2017 and 2018 now match those of the International Monetary Fund, which upgraded its own China growth forecast in July. But 6.7 percent growth for the full year would still indicate a notable slowing over the second half of the year. A cooling property market due to strong government controls and weaker exports growth could impact overall economic output in the second half, analysts say. Indeed, August economic data suggested the world’s second-largest economy is finally starting to lose some momentum as borrowing costs rise. Rising debt in the economy and a reliance on credit to drive growth has also raised worries among groups including the IMF and led S&P Global Ratings last week to cut China’s sovereign credit rating. ADB said it expects China’s monetary and financial policies will remain unchanged this year, while exchange rate reform could include a widening of the trading band for the yuan. But the bank highlights risks that include liquidity shortages from regulatory tightening, global trade protectionism and renewed capital outflows if the dollar begins to strengthen. The Asian Development Bank raised its outlook for China’s economic growth this year on the back of strong domestic consumption, an export recovery and solid growth in services.